Winnebago CEO Mike Happe shaking hands with UDA Secretary Sonny Perdue. Thom Dammrich, NMMA president and ORR chairman, is in the foreground. 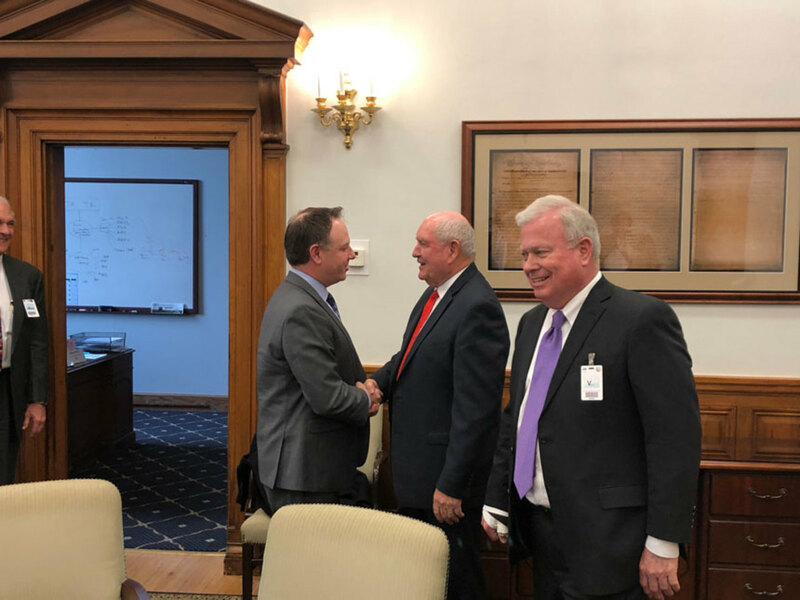 Leaders of the Outdoor Recreation Roundtable met with Department of Agriculture Secretary Sonny Perdue, Under Secretary for Natural Resources and the Environment Jim Hubbard and other key officials of the national forest service. ORR members at the meeting included NMMA President Thom Dammrich, Joe Hoffmaster, MRAA Chair, Winnebago CEO Mike Happe, which owns Chris-Craft, and Polaris CEO Scott Wine. Polaris acquired Boat Holdings in May, 2018. Perdue wants the group to “grow partnerships” with the federal government on public lands and waters inside the national forest system. The national forest system has 400,000 acres of lakes and 4,300 campgrounds. “He invited our help in identifying specific steps forward and ORR will provide those,” said Dammrich. Perdue spoke about his initiatives for recreation during his tenure as governor of Georgia, that included boosting boat ramps, fishing programs, and upgrading state parks. ORR members, in turn, described areas that could have immediate progress. They included: Secretarial support for USFS recreation efforts that capitalize on private investments to expand and enhance recreation infrastructure. ORR also called for overcoming the recreation permitting problems with electronic and simplified applications that allowed timely processing. The group also wants to see more outreach to young Americans and expanded use of conservation corps to enhance recreation. Perdue said the meeting “was very helpful,” and thanked the group. “Let’s capitalize on the fact that recreation is agnostic relative to politics, and let’s help more Americans enjoy the great outdoors,” he said.